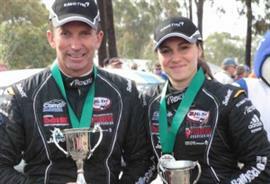 Molly Taylor has finished runner-up in the 2015 Australian Rally Championship, declaring she is delighted to have traded times all season with three-time champion, Eli Evans – and warning she will be even better prepared next year. Taylor and co-driver Bill Hayes came into the final round, the Scouts Rally SA, with the potential to make history as the first female driver to win the national crown, but mechanical issues with their Renault Clio R3, and a rival who was faultless throughout the weekend, made the achievement impossible. Australian rally driver Molly Taylor has won a fully funded drive in the 2016 FIA World Cup for Cross Country Rallies after finishing runner-up in an international desert racing competition. Australian rally driver Molly Taylor has ditched the dirt for tarmac this month, joining a Lithuanian team for a 1000km endurance race. Molly Taylor has made history in the Australian Rally Championship, becoming the first female driver ever to win a heat in a round of the country's premier rally series. Australian rally driver Molly Taylor is pondering the possibilities for 2015 after a strong finish in the 'grand final' of the 2014 Junior World Rally Championship. Australian rally driver Molly Taylor is getting into competition mindset as she prepares for the final round of the 2014 World Rally Championship, Wales Rally GB. Young Sydney rally driver Molly Taylor has won one of the most prestigious awards in Australian motorsport, the Peter Brock Medal.